It’s difficult for me to believe that today is the last day of May. While I’m certain my calendar isn’t lying to me, I’m still confused as to how the time passed so quickly. Where did you go, May? My resolution for May was to cut back on my media intake. I only watched two shows in real time and unsubscribed from three magazines. The battery on my cell phone stopped holding a consistent charge, so I was forced to cut back on my phone and application usage regardless of if it was my intention. Also, I was pretty consistent about using a timer to keep me from wasting time on the computer. Overall, I think it was a resolution that was kept well and will be easily continued throughout the remainder of the year. My goal for June is to get our garage in gear. Our new house has a double car garage and it is incredibly tempting to abandon stuff in there. I tried diligently to not let it become a place where “I don’t want to deal with it right now” items were set during the move, but, alas, some of those things slipped through the doors. My first goal is to get rid of all the clutter. Anything we don’t need will find its appropriate home on Craigslist, be taken to charity, be recycled, or be thrown away. All the clutter will be gone by Friday, June 10. My second goal is to organize the remaining items so I can find things immediately when I need them. The items also must be organized so two cars can fit in the garage, even though we only have one car. We have friends and family who come to visit and their cars should be able to join ours. This goal should be met by the end of the month of June. My mantra: Garages are for cars, not clutter. If you have a garage, can you fit your car inside of it? Would getting your garage in gear be a good resolution for you for the month of June? I know I’m eager to get rid of the clutter and have a garage that really fits my family’s needs. Erin’s 2011 monthly resolutions: January, February, March, April, and May. In observance of Memorial Day here in the United States, the Unclutterer staff has today off from work. We’ll be back here tomorrow with more uncluttering, organizing, and simple living advice. Today we’re going to break with tradition a bit and respond to a number of questions all in one post. My husband and I have a problem — while we’ve managed to declutter our little apartment to a state that makes us both happy, we both *hate* filing papers. It’s the one task that never seems to get done because we both avoid it, hoping the other person will break down and do it. Once papers make it into the filing cabinet they’re fairly well organized, but there always seems to be a heaping pile of envelopes and documents sitting on top of it. Do you have any advice for how to overcome this reluctance to deal with our filing? I dislike filing, too. I wonder if there is someone out there who enjoys it. Anyone? Because filing is such a dreaded task for many people, I recommend making the chore as much of a routine as possible so you don’t ever think about it. This either means doing it every day as a regular part of your mail processing routine (open mail, process it, file important documents, be done with it) or doing it once a week at a scheduled time (Saturday mornings after your cup of coffee). And, when I suggest scheduling it, I literally mean putting it on your calendar at a specific time. If you go with the once a week system, get a decorative box with a lid that is only a few inches deep to set on top of your filing cabinet. The box can be the depository for the papers that need to be filed until your regularly scheduled filing time. Also, if you use a shallow box as recommended, your filing can’t ever get out of control because not much paper can fit inside of it. Be sure to check out our Paper Clutter Begone, part 4 to make sure you’re not filing papers you don’t need to keep. I didn’t get the impression you were from your question, but a nice review of what to keep isn’t a bad idea for any of us. When at work, I’ve found it’s convenient to file whenever I’m on a conference call that doesn’t require my active participation. Also, if I’m trying to solve a problem, I’ll file to give my brain some down time. Researchers have found that alternating between mindless work (like filing) and mindful work increases your overall productivity. If you’re trying to solve a problem at home, maybe sneak in a few minutes of filing even if it isn’t your regularly scheduled filing time. Thank you, C, for submitting your question for our Ask Unclutterer column. I like this desk setup because it has ample storage, a significant amount of clear work surface where Substrata can spread out materials if necessary, and that the area under the monitor is used for things he regularly needs. 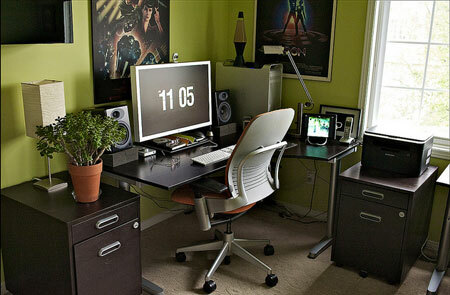 I also love the happy green walls, which are an uncommon color for an office. Be sure to check out other images in the Flickr pool (an alternate standing desk! a listening station!). Thank you, Substrata, for submitting your workspace to our collection. Social geographer Erika Sandow at Sweden’s Umea University has published her doctoral dissertation analysis of long-distance commutes and their impact on income and relationships in “On the road. Social aspects of commuting long distances to work.” In brief, her research found that a commute of greater than 30 kilometers (about 19 miles) typically has economic and career benefits (large paycheck, job advancement) but significantly increases the likelihood a person will divorce (40 percent), especially if the long-distance commuter is male. The dissertation used data collected from more than two million Swedes during 1995 and 2005. The findings, although based on Swedish data, seem to be very applicable to other European and American countries. … those who commute long distances gain access to a broader job market and often to greater career opportunities and better income development. But women and men benefit in different degrees, with income increasing more for long-distance commuting men. However, these commuters’ partners lose income, and since most long-distance commuters are men, this means that many women both take home less money and take on the responsibility for the family and children. – It’s also common for women to take a less qualified job close to home, or to start working part time, in order to drop off and pick up the kids at day care, says Erika Sandow. Her findings show that expanding work regions primarily benefit the careers of men, and continued increases in long-distance commuting may preserve and reinforce gender differences in the home and on the job market. Weighing the benefits and disadvantages of a long-distance job prospect is already difficult for one’s life. Knowing that it also carries an increased likelihood for divorce and stress are just additional points to consider. You can find the majority of the dissertation online. However, the text of four of the chapters is not included, only their abstracts. When frozen, take bananas out of freezer. Oh wait, that isn’t difficult; it’s incredibly easy. Drats. Now what are you to do with that gigantic $50 Yonanas machine that you thought was the only way you could possibly make single-ingredient banana “ice cream”? Thanks to all the wonderful people who sent in this unitasker and its infomercial to us this week. This is one of my new favorite unitaskers. We all have hesitations when it comes to change. It’s normal to drag your feet when you don’t know if the change will be an improvement or if it will last or how other people will respond. Fear of change, however, can keep you from achieving the life you desire and you shouldn’t let “what if …” scenarios rule the day. What if you end up needing an item you purged? You can buy the item again. You can borrow it from a family member, friend, or neighbor. You can discover an alternative. What if I miss my stuff even if I don’t need it again? You’ll only miss your stuff if you’re uncluttering for the sake of uncluttering. However, if you unclutter because you wish to pursue the life of your dreams, you won’t have time to miss your stuff because you’ll be doing amazing things (or not doing amazing things if relaxation is one of your goals). What if my housemates don’t respect the changes I’ve made? Sit down and have a conversation with them outlining your visions for the space and get them on board with your uncluttering and organizing efforts before you start working. Seek out professional help from a family counselor, relationship therapist, or even a professional organizer who can help everyone work together to find common ground. 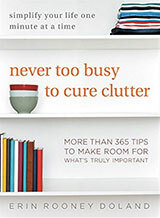 What if I have to unclutter and organize again? 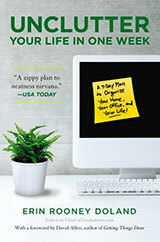 Uncluttering and organizing isn’t a goal, but rather it’s a path to the life you desire. You’ll have regular maintenance tasks as you go forward, but these tasks are usually minimal compared to the first large project. Every day I do something small, like returning items to their proper storage areas. Also, remember that uncluttering and organizing takes practice — the more you do it, the easier it gets. Be prepared to have many bumps in the road as you get started. There isn’t anyone who randomly woke up one day capable of winning an Olympic gold medal. It takes years of practice to create a champion. 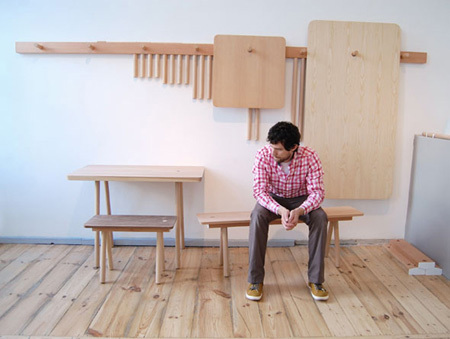 As it it isn’t cool enough that the various components of the Wood Peg furniture system by Studio Gorm can be assembled into a variety of different configurations. The whole system can also be stored on on a wall-hung rail when not in use. Pull a weed. You can do this either literally if you have a garden, or figuratively if there is a small task on your to-do list that will take you just a few seconds to complete. Do it and be done with it. There is no need for that pesky item to bother you any longer. Plan ahead. Many people in the U.S. have next Monday off from work in observance of Memorial Day. If you want to spend the three days relaxing and not tackling a giant list of to-do items, create a list now of the things you need to do before Saturday morning arrives. Then, make a plan for your week for how you’re going to accomplish these tasks. Three days without a giant list of responsibilities hanging over your head will be good for you. Pack a suitcase. There isn’t a reason to really pack a suitcase, but now is a great time to put together a packing list for the next time you head out on a summer trip. Having a checklist is a terrific way to pack wisely and not forget anything when you travel, and making the list now gives you time to get your list in shape. I have 10 packing lists saved on my computer: Romantic weekend with husband, 4-day conference for work, 3-day consulting with client in business casual environment, 3-day consulting with client in corporate business environment, 3-day trip with extended family, 7-day trip with extended family, 3-day relaxing trip with friends, 7-day beach/mountain trip with friends, 3-day sight-seeing trip, and 7-days as a tourist in a foreign city. The lists are all built on the same foundation (toothbrush, toothpaste, etc. ), but each is tailored to meet the experience. With limited drawer and cabinet space I am forced to store my pots and pans one within the other – which leaves the lids to fend for themselves. I’d love to hear if you have a solution. G&S Design has a nice selection of common kitchen tools that compact down into a more convienent size that makes storing them a little easier. Do you have any tips for people with ADHD that go beyond the stuff you see or hear all the time in other publications? Work is pretty okay except for the whole “getting started” part, but my home is the tough area. I am one of those people who has to see something to remember I have it but that keeps things cluttered. Based on the information you provided in your email, it is very likely that you’re a visual processor. I’m one, so I empathize with your need to see your belongings. After years of working with students who have different forms and ranges of severity of ADHD, I’ve come to realize that there will never be a one-size-fits-all solution for staying organized. This is true for the non-ADHD afflicted as well, but for some reason unknown to me, it’s much more widely accepted in the general population than for those with ADHD. So, I’m going to provide a number of different strategies and I suggest you try the ones that speak to you. These same strategies might also work for other visual processors, with or without ADHD. Less is best. Too much stuff in a space likely bothers you immensely. If a drawer or closet gets too full, you may stop opening it and decide to ignore its existence. The fewer items you have in your home competing for your attention, the less you’ll feel overwhelmed by all of the visual stimuli. Just because you can own 25 shirts doesn’t mean you should own 25 shirts. (I own about 20 shirts, but 8 of them are the exact same shirt, just in a different color.) The first step to finding sanity is to get rid of as much clutter as possible — you don’t have to be a minimalist, but a minimalist-influenced space will work well for you. Remember: It is hard to be messy when you don’t have a lot of stuff to get messy. Think outside the closet. A traditional hanging rod for clothes might be a great idea for people who are auditory processors, but they’re likely a bad idea for you. Consider getting an Expedit bookshelf (or something similar) for your closet where you can group outfits together in cubbies. Then, hang a picture of yourself in each outfit on the lip of the cubby hole so you can “see yourself” in the outfit when making decisions about what to wear. (This also helps when returning clothes to your closet.) If cubbies aren’t for you, consider installing valet rods so your clothes can face you. Give your clothes as much room as possible so you can see each item well. Use an accountability partner. I mentioned this earlier in the week, and I think it’s ideal for someone with ADHD. Have a friend come over and sit on the couch and keep you company while you unclutter and organize. The person doesn’t need to lift a finger, his or her presence is usually enough to help keep you on track. Consider duplicates. Although I just suggested you have as few things as possible, it will probably work to your advantage to have duplicates of the things you do use. For example, keep a pair of scissors in the same container as your wrapping paper and another pair in your kitchen and another pair in your desk drawer. The scissors are much more likely to be returned to the wrapping paper storage container after you finish wrapping a present then they are to be returned to your desk drawer in the other room. I have multiple battery rechargers in the house because I don’t remember to recharge batteries otherwise. Shelves are better than drawers. Whenever possible, use shelving for storage instead of cabinets with doors. In your kitchen, consider removing your cabinet doors or having glass doors installed. It’s a lot easier to find things when you can see them. This is true for bookshelves, too. You may prefer to use shelves with outward facing books instead of traditional spine-only displays. Routines, routines, routines. You probably operate very productively when running on auto-pilot. As a result, try to create routines for the repetitive actions of your life — load and unload the dishwasher every Monday and Thursday, do laundry every Tuesday night, take out the trash every Wednesday, etc. It probably takes three or four months for things to become routine for you, so don’t be too hard on yourself as you’re establishing these routines. If you’re consistent, they’ll eventually stop being things you have to remember and become things you just do. Label simply. If you need to make it out the door every morning with your briefcase, car keys, and phone, mark these objects with the letters A, B, and C. Put a luggage tag with the letter A on it on your briefcase. Put a keychain on your keys with the letter B. Adhere a sticker to your cell phone or get a decorative cell phone case with a big letter C on it. Then, every time you leave your house or leave work you only have to remember A, B, and C. You can do a quick check to make sure you have those things, and be on your way. These simple labeling strategies are great for using with kids, too. Use beautiful things. Plain things may feel invisible to you. I can only use manilla file folders for archived papers (like tax returns) because I can’t “see” the files. For active files, I use ones with designs on them — birds, patterns, funny sayings — because the designs help me to remember what is inside them. My desk calendar is designed by Jonathan Adler with bright colors and little designs throughout it. If it’s not pretty, I’ll lose it or forget it. If I like looking at it, chances are I won’t forget about it. If you don’t own many things (see the first “Less is best” point), these beautiful things stand out in your space and tempt you to use them. Thank you, Shannon, for submitting your question for our Ask Unclutterer column. Please be sure to check the comments for even more suggestions from our ADHD and visual processing readers. Good luck on your uncluttering and organizing journey!